Before there was Babe there were other pig stories, though not many I think with a bearing on pigs and worms. Or worms in pigs. But that is the bent in this tall-and-slender volume, which I initially selected for three other reasons: (1) because of its odd cover (gilt-stamped "Sincerely Yours/Lenore Muth" rather than the title; (2) the caption to the portrait of the author ("'Nurse'' said I wonder if it IS worms' "; and (3) the first line of the book ("As a child I played with pigs"). So the book had both everything and nothing going for it before I ever got to the content, which is indeed the story of a pig with worms. I really do love these bits of unusual Americana, something from the early ages of iconic Americans that give a quick glimpse into an average day of a famous-someone way before they became who they became. Getting back to Elvis: this is a back-of-the-book-in-a-paper-pocket borrower's card from a library book borrowed by Elvis Presley in 1948. The book--written by Bessie Rowland James (b. 1895)-- was Courageous Heart, a Life of Andrew Jackson for Young Readers, and was published in 1934. I guess it was appropriate reading,as the Presley family had just (September 12) moved from Tupelo into their new small apartment at 578 Poplar Avenue in Memphis, Tennessee--Jackson being a more-or-less Native Son (though other states claim him as well). Elvis was enrolled at Christine School (formerly known as the Market Street School, and also as the Smith School) on Third Street in Memphis to complete 8th grade the next day, September 13, 1948. The school was demolished in 1948. The book evidently survived. I've established a new page (column at left) to accompany the other Einstein pages, this on abstracts and reviews of Einstein's work (1905-1920) appearing in Science Abstracts (London, Institute for Electrical Engineers). Though the U.S census has been completed decennially ever since 1790, the first census atlas wasn’t published until 1870. The issue wasn’t desire, of course—it was the time that it took for calculation, analysis and design that prevented them from having been published before this date. 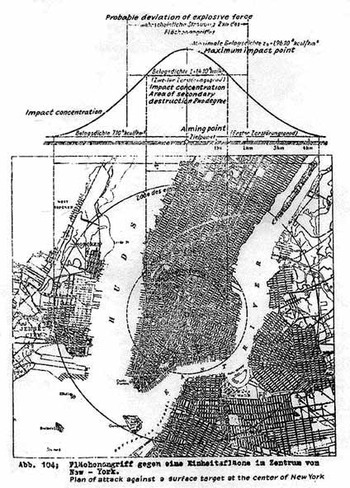 It was still a monumental task of producing an entire atlas of visual displays of quantitative data. 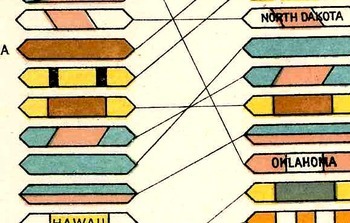 The folding plate Rank of states and territories in population at each census (prepared under the supervision of Henry Gannett, Geographer of the Twelfth Census, printed at the Census Office in 1903 by Julius Bien & Co., N.Y.) from the 1900 census is nearly identical to the 1890 version, only it is about 1/4 of the size. This graphic representation is remarkable because it displays and tracks a total of 348 data points (over time and ranking) using only eight colors. (This atlas has been in my house a long time, and I've known about this plates forever, but I honestly never counted the colors--it is a surprise, really, to see that it was just eight colors being used in what seems like a dazzlingly different assembly of color.) The key was employing different shapes within the 6-sided polygon, making for the whole mass of objects and lines to be much more simply followed. Using more color rather than distinctive shapes-within-shapes would’ve made for a wall of color that would’ve been far less intuitively trackable. This is just simply a fantastic achievement of data display--even if it takes a little while to train your eyes to become familiar with the geomertic shapes and sizes, it becomes quite easy to use. 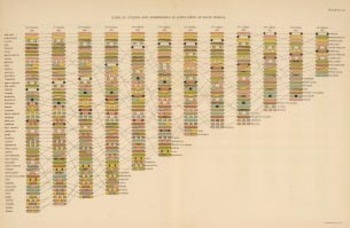 For a complete display of the 1900 atlas, see HERE. "The Wet and the Dry Parts of the British Isles: a Year's Rainfall" birdseye view appeared in the Illustrated London News on 28 January 1911, and it is a lovely and scarce example of a meteorological graphical display of quantitative data rolled into an oblique view. I just happened upon this, but since it is the British Open and all I though to publish it here. The map was composed for the Illustrated London News, 3 July 1920, by W.B. Robinson. It shows the number of links around the city of London--seems like a lot to me, and this data doesn't even include miniature golf, which was very big at this time. The Key: M = a "membership" club; L = Ladies; A = "associate", and the year underneath is the year the course was organized. The game is evidently older in Scotland, but around London golf dates to the time of James I. What Did the Delivery of the Plutonium for the First Atomic Bomb Look Like? The photo above shows the plutonium being delivered to the McDonald Ranch, carried from the Plymouth through the small wooden structure that we can clearly see in the color photo below, in which you can also see the short stone fence that surrounds (in a roughly 85'x85' square) the compound. The plutonium was then sent into the dining room, which had been converted into a clean room, where the device was assembled. The McDonald Ranch was right there at the heart of the Trinity Test Site, or nearly so (the explosion on 16 July 1945 being about two miles away, slightly damaging the structure), in the Llano Estacado. This is a section of New Mexico and Texas (the "Staked Plain"), which had for centuries been a ruthlessly mercy-free zones for people for centuries until it was conquered in the late 19th century--a hard and arid place where people disappeared. Much of the Trinity Site was actually located in the Jornada del Muerto, or "Path of the Dead Man", or more poetically, the "Dead Man's Walk". In any event, seeing the plutonium core taken out of a Plymouth and moved into a converted farmhouse and ultimately carried in one hand by a U.S. army sergeant into an assembly area that used to be a bedroom created an odd emotion, one that I'm still trying to identify, seeing the smallness of it all the result of enormous expenditures of energy and effort and brainpower over a thousand-day period all represented in the hand of one man. Seagrams V.O. Canadian Whiskey powered the future through a series of a dozen or so ads for itself in the 1945-1947 period, taking a usually-strangled though occasionally interesting peep into what the future might bring. (And of course the future is brought by men who drink Seagrams.) In this ad, appearing in the 12 May 1947 issue of LIFE Magazine, we are told "deserts will bloom through atomic power"--how this might happen is left to the imagination. Also left to fantasy is what exactly is being farmed there in front of the incongruous "atomic energy plant". Plastic smoke? Taking a fractured approach to the possibilities one might say that atomic bomb mushroom clouds are being grown from seedlings here from the ground up, nurtured until the day they too will be as big as the blasts of August 1945. Oddly enough, the illustrator--who after all was just trying to sell alcohol--came pretty close to the truth, except that they got the power source wrong. Rather than nuclear energy, it would be petrochemical industries that would lie there at the heart of America's farm production (via seeds and fertilizers and so on)--I'm sure that it would've made more sense in a weak way back there in 1947 to believe the atomic story rather than the possibility that it would be petroleum that would drive the entire production of food forward. There were many proposed uses for atomic energy over the next few decades, most not very good--the Ford Nucleon, a screamer with a 5,000-mile cruising range powered by a steam engine driven by a small uranium fission muscle box in the car's rear, was one of those ideas. The nuclear-powered submarine, which sounded like the Nucleon in 1946, was a solid workable idea, a science fiction come true in 1954 with the launch of the USS Nautilus (SSN-571). and others, including a few posts that shows Manhattan sinking under its own weight, floating in the air, and set adrift in the Hudson. The October 1945 issue of Popular Mechanics carried a story "Atomic Bomb for War / Atomic Bomb for Peace" as a reminder, I guess, to its readers that the vast destructive power of the atomic bomb was just one example of what nuclear power might be--and that there could be incredible and wide-reaching benefits of the process for peaceful uses. This work came about eight weeks after the bombings of Hiroshima and Nagasaki, and seems to be only the second post-use story on the weapon. Half of the article's illustration is dedicated to military applications of atomic energy, and the other to the peaceful; and in the upper-middle of the military side we are told that if necessary that every city in Japan could be completely destroyed with "5,000 atomic bombs". The truth of the matter is that a great percentage of the major (and minor-major and major-minor) cities had already been pretty much decommissioned. (Just weeks before the bomb came the massive firebombing of Tokyo--334 of General Curtis LeMay B-29's were loaded to utmost capacity with the newly-conceived M-69s bomb, an incendiary so vicious that the fires it produced were all but inextinguishable. The B29's bombed Tokyo for hours, killing 100,000+ people and making over a million homeless.) And so I'm not sure what the message was, here, except to establish that the complete destruction of a city with weapons dropped from planes was now a possibility. It was probably right at about this point that this idea became a real possibility--and so to for its extension, that given enough of these weapons, that the entire world could be bombed out of existence. By 1610 Galileo had produced his fifth and most powerful telescope, allowing things to be seen one thousand times closer than ever before, using it to make enormous discoveries–discoveries so big in fact that their towering significance is a bit hard to understand today in the context of early 17th century knowledge. It was all published in his fantastic Sidereus Nuncius on March 4, 1610—the extraordinary tale told in the very title page of the book, proclaiming some of the great discoveries of Galileo’s adventure. One monumental outcome of Galileo’s work was expanding the number of stars in the sky, which was basically mucking around with the perfect plan of the Creator–formerly a cornerstone for the existence of a divine being. With the exception of comets and eclipses the sky had remained immutable, a perfect score of the creator’s creation, until 1572, when Tycho Brahe noticed something new in Cassiopeia, something that was not a comet—a “something” that was a star. This was momentous because the night sky had been seen for centuries as being complete—a new star, the Nova of Brahe, contradicted this high belief, offering the possibilities of newness where there had not been one previously. And so too with Kepler’s new star of 1602. But it is with Galileo that all of this newness really finds a firm footing, challenges to the religious basis for belief in the heavens and all, not to mention the great amount of new scientific data presented in the pages of Sidereus Nuncius--it was the first time any scientific data had been published that was collected through the use of a telescope, and pictured such extraordinary things as the mountainous surface of the Moon, a view of our Milky Way, several moons of Jupiter, and other fantastic wonders. The very full title page reads: The Starry Messenger, great and very wonderful spectacles, and offering them to the consideration of every one, but especially of philosophers and astronomers; which have been observed by Galileo Galilei … by the assistance of a perspective glass lately invented by him; namely, in the face of the moon, in innumerable fixed stars in the milky-way, in nebulous stars, but especially in four planets which revolve round Jupiter at different intervals and periods with a wonderful celerity. Trinity Shot, 1945, Video via the Department of Defense, located at the Internet Archive, here. I found this in the Alex Cashman's lovely site, Mathematical Fiction (here). The except is from Charles Dicken's Hard Times (1854)1, and in it we see Dickens making another in a long series of assaults on what he thought to be a disturbed social layering of dealing with the underclasses and the working poor.--and this time in the form of an entire novel. In the instance sited below (of interest right now because of its maths connection), Dickens makes a case for the"success" for the government of the fictitious city of Coketown to see a relatively small percentage of people in that city starving to death on its streets to be not a success at all. The character making the complaint is Sissy Jupe, whose fault at school came when asked the percentage of the starving/dying responded by saying it really didn't matter, because people were starving anyway, and whether it was one or a thousand dying from something as fixable as hunger meant all the same thing. She was presented with the "statistics"2 from her teacher, but to Ms. Jupe it came to her ear as "stutterings", which is what Dickens felt the numbers were. Dickens was attempting to make those people suffering in the streets less blank, less hollow, and more than a number. 1. It should be pointed out here that this is Dickens' 10th novel, the 42-year-old already having a enormous success with his writing and an even grater one in his storytelling. To this date, Dickens had already written The Posthumous Papers of the Pickwick Club (Monthly serial, April 1836 to November 1837; The Adventures of Oliver Twist (Monthly serial in Bentley's Miscellany, February 1837 to April 1839); The Life and Adventures of Nicholas Nickleby (Monthly serial, April 1838 to October 1839); The Old Curiosity Shop (Weekly serial in Master Humphrey's Clock, 25 April 1840, to 6 February 1841); Barnaby Rudge: A Tale of the Riots of 'Eighty (Weekly serial in Master Humphrey's Clock, 13 February 1841, to 27 November 1841); A Christmas Carol (1843);The Chimes (1844); The Cricket on the Hearth (1845); The Battle of Life (1846);The Haunted Man and the Ghost's Bargain (1848); The Life and Adventures of Martin Chuzzlewit (Monthly serial, January 1843 to July 1844); Dombey and Son (Monthly serial, October 1846 to April 1848);David Copperfield (Monthly serial, May 1849 to November 1850); and Bleak House (Monthly serial, March 1852 to September 1853). Remarkable. 2. "Statistics" as a word has been in use for a long time, finding air as early as 1787, at least so far as the sense in which it is used here. There are earlier references, but they actually refer to the "state", as in "statecraft" and government and such, and not for interpreting a collection of data. In Paul Nahin'sTime Machines, Time Travel in Physics, Metaphysics, and Science Fiction (Springer Verlag, 1999), the author Paul Nahin makes a good case for St. Thomas Aquinas (1225-1275 or so) being a very early questioner of the concept of time travel (on pages 161-162). In the Summa Theologica it does seem to me that Aquinas does indeed talk this way, if relating his comments to the ability of God to make changes in the past, present and future. Hence all things that are in time are present to God from eternity, not only because He has the types of things present within Him, as some say; but because His glance is carried from eternity over all things as they are in their presentiality. Hence it is manifest that contingent things are infallibly known by God, inasmuch as they are subject to the divine sight in their presentiality; yet they are future contingent things in relation to their own causes.1 Summa Theologia, reference below, source here. I honestly do not know without doing some research how this sort of thought would have been received by other theologians, where the practices of God are omnipotent and unrestricted. For God not to be able to alter the future limits the logic of God's actions, and seems to establish a limit in general to a limitless idea. Perhaps Aquinas is a very early version on the assault of the completeness of the perfect creation of God's universe, something that would be put to the test in the scientific discoveries of the coming centuries. For example, with Galileo discovering that the night sky was hardly complete and perfect as had been thought, viewing nearly an order of magnitude more stars with his telescope than had (of course) never been seen before. Suddenly, the unchanging sky of the great creation was hardly so, and that it was far more vast than had ever been shown. Same too with the creation of a vacuum by Otto von Guericke with his experiment's results published in his Experiemnta nova (ut vocantur) Magdeburgica de vacuo spatio (Amsterdam, 1672, and which I wrote about here), something that assaulted the speculation that God could not create nothing, that the existence of a perfect nothingness was not possible.